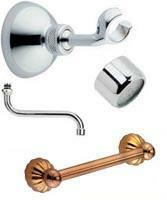 DI LORENZO GIUSEPPE & C. SNC, Robinetarie sanitara, handles for plumbing appliances, garden taps, pe EUROPAGES. Manufacture of brass handles for classic, luxury and lever taps for bathrooms. We create on request special handles, rings, stoppers, cross handles, screws, handles for switches, handles for ceramic discs, lever handles and handles for single levers; caps, eccentric caps, showers, showers, rods for taps, hoses and plugs; resin handles, brass, polished brass, chrome and gold plated handles and accessories for bathroom fixtures.